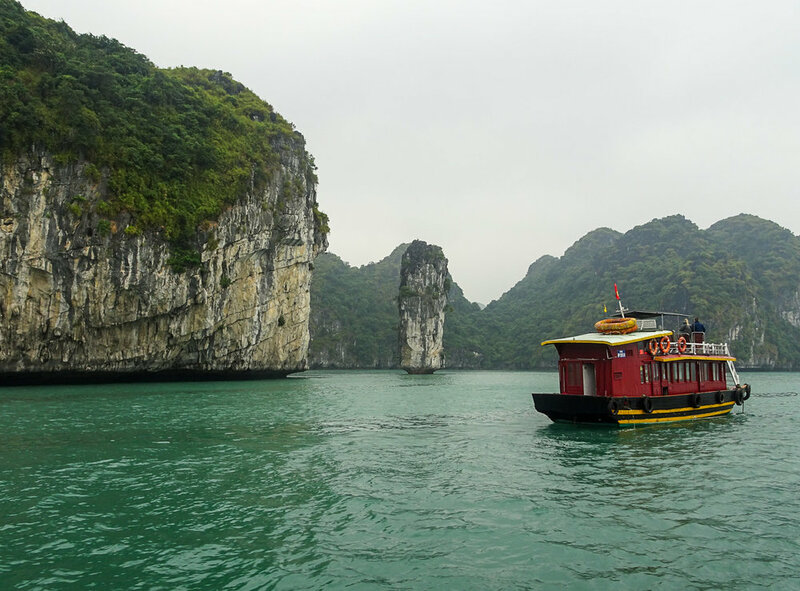 At the top of many traveler’s lists is VietNam’s famed Ha Long Bay. This gigantic bay is everything you picture the coast of Southeast Asia to be: turquoise waters, dramatic cliffs, vibrant green hill sides, and thousands of islands. Unfortunately, the boat trips around Ha Long Bay can be hundreds of dollars per person and put this destination out of reach for many budget travelers. One night, Megan and I were having a conversation at a street food restaurant in Bangkok about Ha Long Bay being so expensive, when a man sitting at a table next to us chimed in. After explaining that he had lived in Hanoi, VietNam for several years, he proceeded to tell us to visit Cat Ba Island rather than Ha Long Bay. We took his advice and are sure glad we did! Getting there is cheap but takes a bit of time. We paid $12 USD each, for a round trip ticket from Hanoi. The bus picked us up from the hostel at 8 AM and drove for 3 hours to the pier. We then took at 30 minute ferry ride to Cat Ba Island followed by another hour bus ride to Cat Ba Town where the bus dropped us off at our hotel (which was $7 USD per night). All in all, easy and cheap! Of course, we immediately rented a motor bike ($4 USD) and set out to explore the island. We checked out a cave that was used in the VietNam war as a hospital for wounded soldiers. It was super interesting and we'd highly recommend if you have time to explore the island! We then proceeded to drive along the coastal roads and ended up at the top of a mountain that overlooked Lan Ha Bay. The summit was also home to Fort Cannon, an old Vietnam war relic that housed artillery and other battle supplies throughout the war. Panoramic views with a side of history is always a plus! The next day, we took a 1-day cruise around Lan Ha Bay. We booked with Mr. Pineapple, of Pineapple Hostel, who was hilarious and super helpful. You can find his hostel in downtown Cat Ba and we'd highly recommend booking with him! The boat tour included swimming, kayaking, breakfast, a delicious 5-course meal for lunch, a trip to a floating village, and stop at Monkey Island for hiking. The price? $7.50 USD per person! First stop was the kayak tour around Lan Ha Bay. This was probably our favorite part of the cruise because we got to get up close to all the limestone karsts and even check out a few of the hidden caves! After kayaking we stopped for a swim - even in the cold temps the water was warm! I got to show off my signature flips from the top deck of the boat, so that was cool. The boat then took us to "Monkey Island" where we climbed to the top of a peak overlooking the beach and part of the bay. As you would expect, lots of monkeys were following us around. It should also be noted that the hike is more of a rock scramble on top of sharp, loose lava rock. It was fun but definitely not the easiest. For our last stop we toured a floating fishing village that even had electricity! The kids that live here take a boat to the island every day for school. Cruising around between each stop was just as spectacular as the activities themselves! Lan Ha Bay was breathtaking even without warm sunny weather. The town of Cat Ba has a lot to offer as well! There are a couple lively bars to hang out in at night and some great local restaurants to enjoy along the waterfront. Our top recommendation is the vegetarian restaurant Buddha Belly! Again, everything is super cheap (think $.50 beers)! Overall, we found Cat Ba to be the perfect location for our tight budget and we still got to see everything you would on a similar tour in the popular Ha Long Bay. Make sure you check out this great destination if you are budget travelers like us! Especially in the off-season when you'll be some of the only tourists there (like us)!